It’s not a terribly difficult name to remember: La David Johnson. Five syllables for a fallen soldier who died in an ambush in Niger earlier this month. But according to Rep. Frederica Wilson, a Democrat who represents the district where Johnson was from in Florida, that name was too much for Donald Trump to remember. Wilson sat in on Trump’s call on Monday with Myeshia Johnson; the conversation took place nearly two weeks after Johnson died in an ISIS-affiliated attack. Those comments made Wilson “livid”—so much so that she actually demanded to speak to Trump on the phone. The congresswoman was there because she has a personal connection to La David and his family. Wilson told CNN that after Trump’s comments, Myeshia broke down crying. If Wilson’s account is true—and she maintains that it is—it appears y’all’s president was so obsessed with the patriotism of NFL players and the respect they show for the country that he forgot to learn a fallen soldier’s name. Trump refuted Wilson’s version of events, tweeting that the “Democrat Congresswoman totally fabricated what I said” and claiming he had “proof” of the matter. Frankly, it looks like he may not know Wilson’s name, either, but I’ll just leave that there for the moment. Trump’s tone-deaf remarks have prompted people to donate to a fund for the Johnson children. Michael Skolnik, co-founder of the Soze Agency, issued a call on Twitter this morning to raise $5,000 for a scholarship fund for the family, which now has raised more than $300,000. It’s tempting to be blithe about Trump’s tweets, his self-absorption, his coarseness, his uncanny ability to make himself the star of every story. And just when you think you’ve gotten used to it—that you’ve exhausted your disbelief—Trump challenges you with yet another low. It’s why people who cover politics often reckon with Trump’s actions with a strange cocktail of incredulity, shock and gallows humor. Let’s strip this incident of all that. This is about an act of basic decency: the acknowledgment of a life lived. About the president, the commander in chief, conferring on the death of a soldier some degree of dignity. It is an act of fundamental kindness. Though Trump is directly contesting Wilson’s version of events, she’s not the one he failed. He failed Myeshia Johnson. He failed her by waiting almost two weeks before even acknowledging La David Johnson’s death and those of his three comrades. 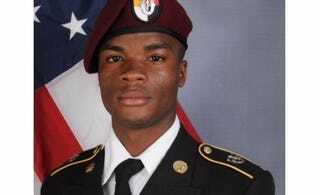 Only after being forced by the media last Monday to contend with the deaths of Johnson and three other soldiers did Trump say he would reach out, finally, to the families of the dead soldiers. He failed her when he sullied that pledge with a mean-spirited lie about former President Barack Obama, who Trump claimed never contacted the families of soldiers killed in combat. It was a lie that Trump concocted, as he often does, to belittle the country’s first black president and to puff himself back up again. And he failed her again on the same day Myeshia saw her husband’s remains return under the flag of the country he served, when Trump couldn’t even say his name.